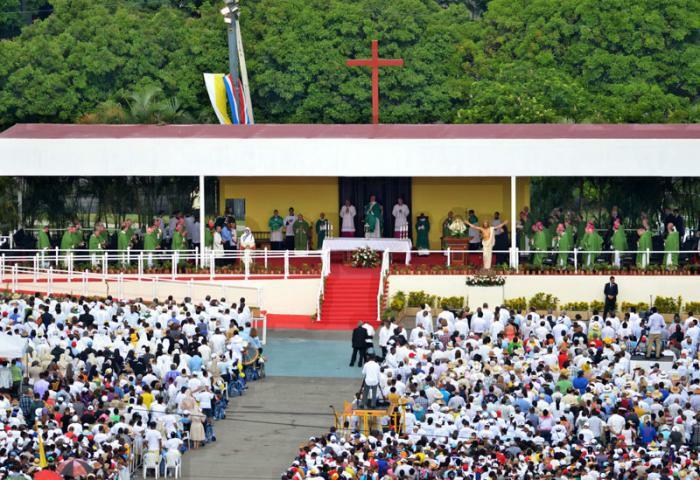 On Sunday, September 20, 2015, Pope Francis celebrated mass in Havana’s Plaza de Revolutión before a crowd of thousands. In attendance were Cuban President Raúl Castro and other government officials. 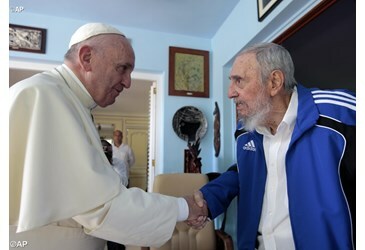 The Pope also had separate private meetings with Fidel and Raúl Castro and later presided at a vespers service and met with a group of young people. “Who is the most important? Jesus is straightforward in his reply: ‘Whoever wishes to be the first among you must be the last of all, and the servant of all.’ Whoever wishes to be great must serve others, not be served by others. Although the Pope had no direct remarks regarding political issues facing Cuba, he did mention the ongoing peace negotiations in Havana between the Colombian government and the FARC rebels. He said, “I feel bound to direct my thoughts to the beloved land of Colombia, ‘conscious of the crucial importance of the present moment when, with renewed effort and inspired by hope, its sons and daughters are seeking to build a peaceful society.’ May the blood shed by thousands of innocent people during long decades of armed conflict, united to that of the Lord Jesus Christ crucified, sustain all the efforts being made, including those on this beautiful island, to achieve definitive reconciliation. Thus the long night of pain and violence can, with the support of all Colombians, become an unending day of concord, justice, fraternity and love, in respect for institutions and for national and international law, so that there may be lasting peace. Please, we do not have the right to allow ourselves yet another failure on this path of peace and reconciliation.” He also added a word of gratitude to President Raul Castro for his efforts to assist the negotiations. In the early afternoon Francis met with Fidel Castro for about a half-hour at the former Cuban leader’s home. The conversation was reported to be informal and took place in the presence of Castro’s children and grandchildren. Francis’ biographer, Austen Invereigh, thinks the Llorente materials were sending a subtle message to Fidel, whose rule was marked by conflict with the Catholic Church and other groups. Later in the afternoon the Pope met with President Raúl Castro and other government officials at the Palace de la Revolutión as shown in the above photographs. 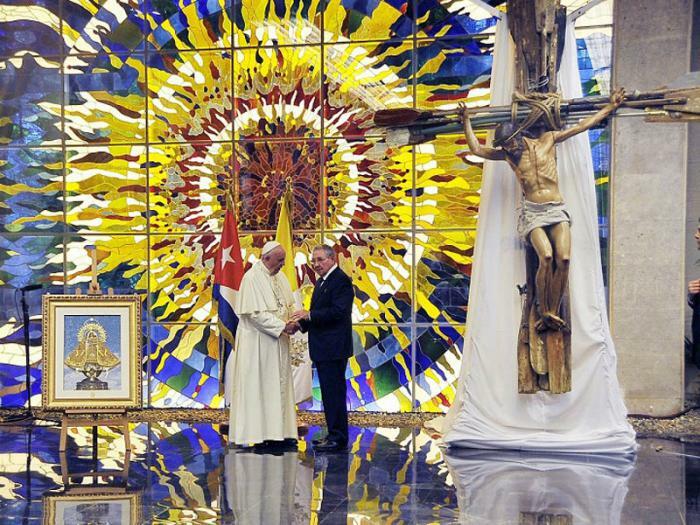 The President showed Francis what appear to be official gifts for the Pontiff on display inside the Palace: a huge crucifix made of oars and a painting of the Virgin of Charity of Cobre, Cuba’s patron saint. That evening Francis presided over a vespers service in Havana’s 18th century Immaculate Conception and San Cristobal Cathedral. He also warned of the dangers of falling prey to the temptations of wealth. “When possessions enter the heart and guide your life, you have already lost, you are no longer like Jesus. He quoted St. Ignatius when he said that poverty was the mother and also the wall of consecrated life. Pope Francis summoned the spirit of dispossession, to leave everything behind in order to follow Jesus. Francis finished his busy day with a meeting with hundreds of young people at the Félix Varela Cultural Center, which is the former San Carlos and San Ambrosio Seminary and which is not far from the Cathedral. In his message to the young people, Francis cited the words of a Latin American writer: “People have two eyes, one of flesh and the other made of glass, with the one of flesh we see what we are looking at, with the one made of glass we see what we dream.” The ability to dream must be included within the objectivity of life. “He who cannot dream is not young.” Dream that the world may be different, if you give the best of yourselves you will help to have a different world. “ Do not forget to dream,” he insisted. Once again I am impressed and moved by the words and actions of Pope Francis. He has a constant message of humility, love and forgiveness for individuals and nations. I give thanks to God for Francis! Yardley & Ahmed, Pope Francis Celebrates Mass at Political Heart of Cuba, N.Y. Times (Sept. 20, 2015); Reuters, Pope Celebrates First Mass in Cuba, N.Y. Times (Sept. 20, 2015) (video); Assoc. 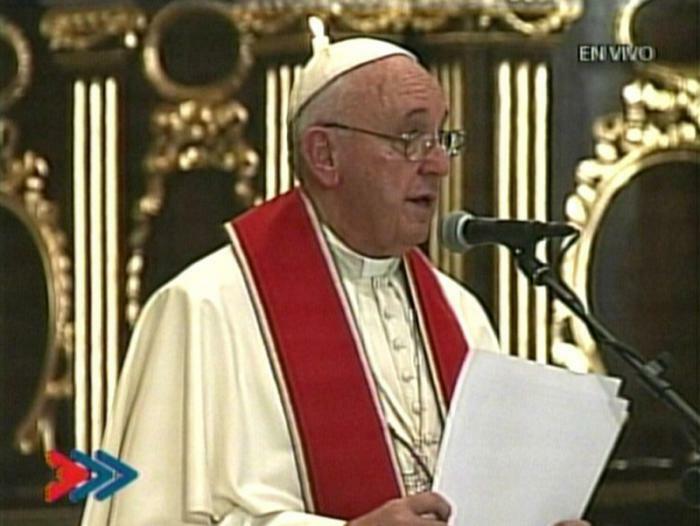 Press, Pope in Cuba Begs Colombia, Rebels to End Conflict, N.Y. Times (Sept. 20, 2015); Assoc. Press, The Latest: Pope Presides Over Vespers Service in Cathedral, N.Y. Times (Sept. 20, 2015); Reuters, Pope Meets Fidel Castro, Warns Against Ideology on Cuba Trip, N.Y. Times (Sept. 20, 2015);Assoc. Press, The Latest: Pope speaks of importance of poverty to the church, Wash. Post (Sept. 20, 2015); Pope Francis in Havana’s Plaza de la Revolución (+ Photos), Granma (Sept. 20, 2015); Pope Francis in Cuba: Minute by minute, Granma (Sept. 20, 2015); Pope in Havana: prays for success of Colombian peace talks, Vatican Radio (Sept. 20, 2015); Pope in Cuba: serve rather than be served, Vatican Radio (Sept. 20, 2015); Pope meets former Cuba president Fidel Castro, Vatican Radio (Sept. 20, 2015); Pope at Vespers: Be a poor and merciful Church in Cuba, Vatican Radio (Sept. 20, 2015).